Most film directors usually feel compelled to adhere to a strictly “beginning, middle, and end” format to their movies even though we all know real life is just a bunch of rehashed flashbacks! 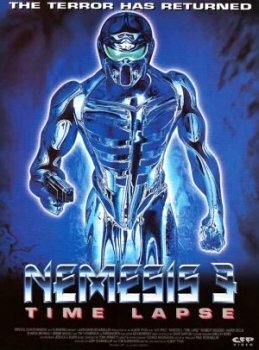 Director Albert Pyun recognizes this and ingeniously combines his greatest works into one audaciously substandard mangled up cyborg of a movie with Nemesis 3: Time Lapse! It all started way back in Nemesis 2: Nebula (well, it really started way back in Nemesis, but whatever) when a genetically engineered baby (Alex) was sent back through time into 1980s East Africa where she grew up into an apocalyptically muscled up chick with blonde corn rows. Then a cyborg bounty hunter showed up and they fought until she rammed his hand into his head! Nebula 3: Time Lapse is like a love letter to all us Nemesis 2: Nebula fans. We loved Alex running, jumping, and shooting stuff in that movie, so Pyun hits the editing bay, tints all those scenes blue and splices them in between scenes of Alex standing around chatting Tim Thomerson up in the desert! And like a Lament Configuration of Nemesis-inspired mayhem, Thomerson appears to reprise his role from the first movie – the one that Alex was not in! Well, not this Alex anyway! Olivier Gruner played an Alex who fought Thomerson’s cyborg in the first movie, but is no relation to this woman Alex! But wait! Thomerson isn’t playing the same guy in this movie that he played in the first movie! Except that he is! Sort of! Thomerson originally played the LAPD guy named Farnsworth who was an exact cyborg copy of the real Farnsworth. This time, he plays a cyborg named Farnsworth 2! And he has new superpowers that allow him to turn into an absolutely terrible computer generated special effect of a robot! And he can shoot lasers out of his glowing eyes! 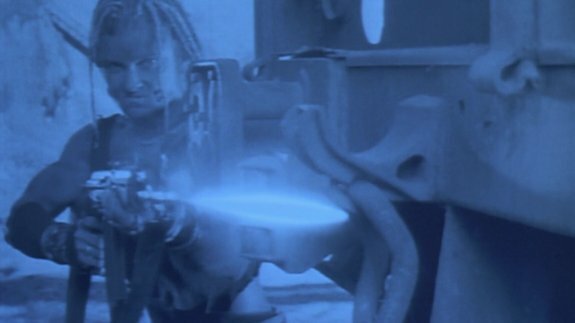 Once Alex gets done with her thirty minute flashback (Farnsworth 2 helpfully advises that she lost her memories because she shot herself in the head and it grazed her brain), the movie then shifts back to a sixty minute flashback of the time between the end of Nemesis 2: Nebula and when Alex was shot. This is where Farnsworth 2 and his crew cruise around the desert trying to capture and scan Alex because her genetic make up supposedly holds the key to beating the humans once and for all. It’s a generally mind numbing affair sure to cause a desire in viewers to time travel back to a time when they spent money on movies that made a little sense. Alex has a half-sister she is suddenly looking for. Nebula returns and is being examined by her half-sister and manages to reconstitute itself and is still looking to collect the bounty on Alex, even if that means fighting with Farnsworth 2. Meanwhile, Alex decides to fall in love with a brain damaged mercenary while fending off two black female bodybuilder cyborgs in white wigs who are trying to capture her. By the time the movie finishes and Alex is right back where she started before all her flashbacks, she doesn’t know what the hell just happened to all the people she escaped with! And then we’re informed that Nemesis 4 is next! Shot on the same locations as Nemesis 2: Nebula, you’ll be at a moderate risk of thinking you’re having your own set of flashbacks, but the one way to assure you that this movie hasn’t somehow grazed your brain is to remember that all the really cool action scenes occurred in Nemesis 2: Nebula, while all the bad computer effects occurred here. Once you get a look at the silly fish-eyed blob lens technique employed to disguise the dune buggy Alex steals, you won’t be losing any sleep over the prospect of cyborgs taking over the world. That and the fact that this time around there’s about five or six cyborgs after Alex and they manage to be even less effective than Nebula. These dumbots ought to just give it up and take their chances with fighting Alex and the humans in their own time. How can you go back almost 100 years in time to a war torn Africa and not defeat one gal and her dull witted boyfriend? Sounds like a job for Nemesis 4!